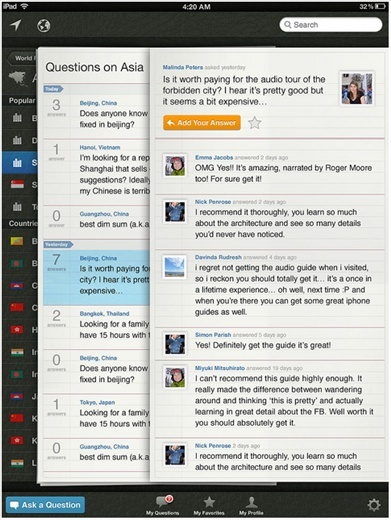 If you travel and have an iPad, we are looking for Beta testers of our new travel answers iPad app. What is the travel answers iPad app? You can use it to help plan your travels either before you go or while you are already travelling. Because it works offline, you to carry your travel knowledge with you when you travel. You can ask travel questions while on your trip and even if you are offline on that bumpy bus or train. When you ask, your question actively gets routed to the travellers most likely able to answer it for you. Unlike a forum, it is actively trying to find an answer for you or to connect you with other travel experts to help you. Likewise, the more you use it the more you'll get questions about places you've been so you can contribute travel answers to help other travellers. It synchronises your account when you have a WiFi or network connection. You can find answers to travel questions about where you are right now. As far as we know there is nothing else quite like it out there. We'll then tell you how to get it onto your iPad, wherever you are!